Volleyball Net Height: What is it for Men, Women, Coed and Sitting? What's the height of the volleyball net? The volleyball net height varies for the men and women. 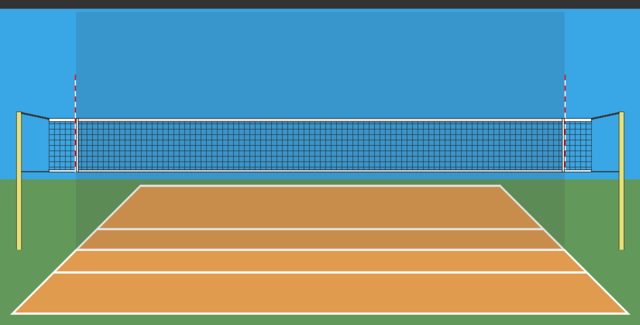 According to the official rules for indoor courts the men's net height should be set at 7 feet 11 5/8 inches (almost feet 8' 0"). For the women the net should be set at seven feet four 1/8 inches (7' 4 1/8" ). There are also official net heights based on players belonging to different age groups. The net height is lower for players age 11 to 15 and its lower for ages 45, 55 and 75. What's The Official Net Height? 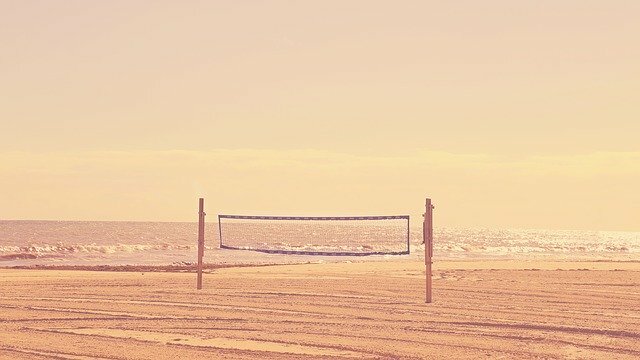 At the end of the 1800s, when William G. Morgan first invented the sport, he initially established the original volleyball net height at six feet six inches. Since the sport was introduced first to the YMCA, the Young Men's Christian Association, only men were playing the game so the first net height was pretty low compared to the height it is today. 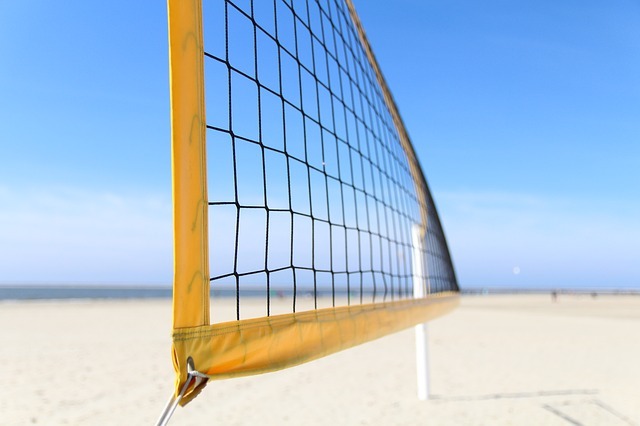 Today for the men, the official volleyball net height which is measured starting at the top of the net, in the center of the court to the ground, should be seven (7) feet 11 5/8 inches. For those who use the metric system, that's 2.43 meters. The women's volleyball net height, who's measurements are taken the same way, from the center of the net is officially 7 feet four 4 1/8 inches. In meters that reads, 2.24m. The height of the net is measured from the center of the playing court. Above the two sidelines, the net height has to be exactly the same and "can't exceed the official height by more than 2 cm (3/4"). What Are The Net Height Changes With The Variations of the Game? With time, different variations of the game developed, from coed to reverse coed to the development of championships and leagues for maturing senior age divisions for players in their 40s, 50s, 60s and 70s. With these variations in the game, the volleyball net height evolved and changed to lend itself to the competitiveness and physicality needed for each version of the game. For example, in the Asian community, in the very popular nine person vs. nine person game, not only is the court larger, but the official volleyball net height, is lower at 243 cm. Sitting volleyball is another version of the indoor game...with court size, net height and some rule modifications that allow disabled individuals to play the game competitively. While the net dimensions remain the same as those of indoor competitions, in sitting volleyball the court is smaller at 10 x 6 meters. Instead of a three meter line, which we call our ten foot line in the US competitions, in sitting volleyball, they play with a two- meter attack line. In the men's sitting competition, the official volleyball net height is 1.15m while for the women it's 1.05 meters which is approximately three and a half feet. Coed volleyball is played with two, four or six male and female players on one team playing against the same number of players with the same team composition on an opposing team. In coed fours and sixes, the men play in the front row and the women play in the back row, all the time, with no rotation of the sexes in the traditional rotation process for six man volleyball. In coed doubles, or two vs two, the men play on the left side, the power side, with the primary responsibilities of staying at the net to hit in offense and to block on defense. The women play on the right side, always, and their job is to stay back row to play defense and to set their male partner when their team is on offense. Passive vs, aggressive...wow even in volleyball. Who knew? 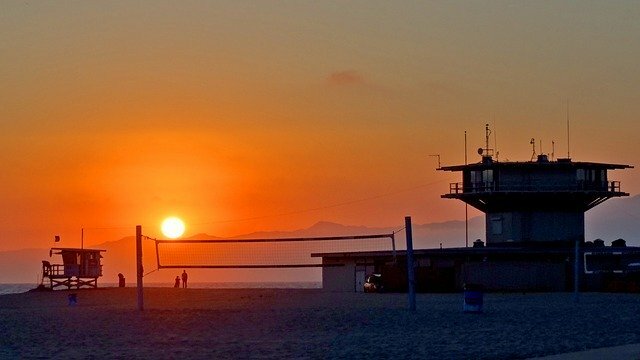 Coed volleyball and men's volleyball both have the same official net height at 7 feet 11 5/8 inches. Easy to see why, since in these versions of the game, the "big" men are front row always hitting and blocking at the net, which for the smaller female players isn't even a factor since the rules state the women play only in the back row. In many intramural and rec leagues, players will set the coed volleyball net height somewhere between the men's official height and the women's height. Women are jumping and hitting much harder and higher now so the makeshift net height makes the game even more competitive during coed matches. Speaking of women, hitting harder and blocking bigger ..this led to the variation of the game called coed reverse. In reverse coed competition, women play front row and men play back row on a team of four or six players playing against an opposing team of four or six players. As you can imagine, now the roles are "reversed." The females play the power game, staying in the front row with the blocking responsibilities when their team is on defense and maintain the primary hitting responsibilities when on offense. The men can hit from the back row but primary hitting responsibilities are held by the females in the front row. In coed reverse doubles, the females play on the left side and stay in the front court in defense going to the net to block. Male teammates play on the right side and have the setting responsibilities and defense tasks in the back court. The official net height for reverse coed is the same as the women's official height, which 7 feet 4 1/8 inches. Things that make you go "Hmmm!" Starting to make sense now?